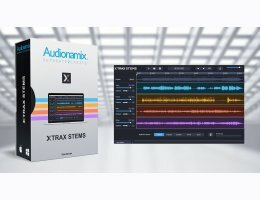 Powered by brand new, artificially intelligent algorithms, XTRAX STEMS 2 offers faster, cleaner stem separations, backing tracks and acapella at the same low price. Created for DJs, music producers and remix artists, XTRAX STEMS allows users to separate any song into its vocal, drum, and remaining music components for easy sampling, remixing and unmatched control during live sets. The new Advanced algorithm is 30% faster and dramatically improves separation quality when creating backing tracks and when separating lead, background, and harmony vocals into a single stem. Improved, high fidelity drum processing increases the quality of drum stems and reduces drum interference in both vocal and music stems. Fine-tune and optimize separations using the new, real-time Separation Balance feature. Use presets optimized for creating acapella, drum, and backing tracks or create a custom balance using the fully-adjustable matrix. **Current owners can get this upgrade for free from their Audionamix website account area.